This is an easy recipe for MAME GOHAN. Adopted from a recipe by Yoshiko Tatsumi. Just turn on the rice cooker after adding shelled peas and rice. I can oversleep 20 minutes in the morning, luckily. 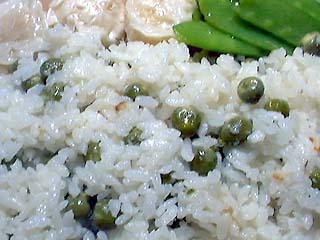 The proportion of rice to peas is 1:0.3-0.8 in the references. In our family, a rice: peas ratio of 1:1 is normal. Take care when cooking because the amount will increase by 30%-50%. "Shelling peas" is kids work. Every reference book writes "The best way to make MAME GOHAN" is using fresh shelled peas, so it is better to use garden fresh peas. Kids might enjoy helping you. At this time we shelled 2 sacks of peas and they became 4 cups. If you prepare 3 Goes of rice, 2 cups of peas should be fine. Put washed rice into a rice cooker. Add Sake, salt and proper amount of water. Put the dried sea kelp and then put the peas on top of rice. Don't mix. Lastly turn on the electric rice cooker. After the rice is cooked, turn it into a bowl and mix using a wooden spatula.